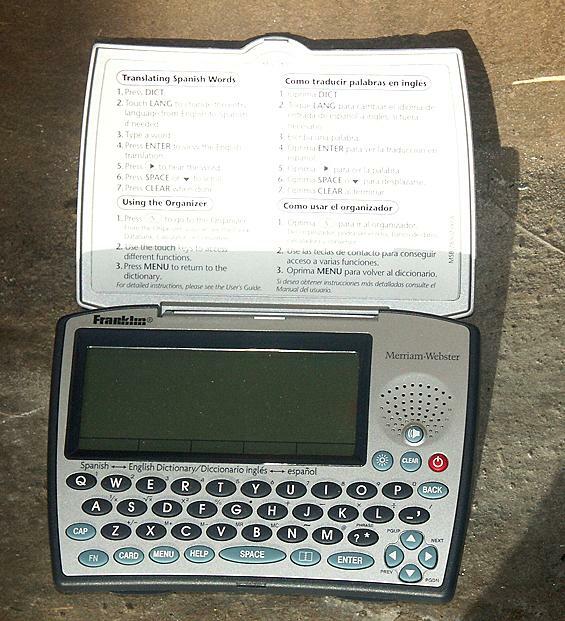 My husband bought a Seiko electronic Spanish translator for under $20. It has been very handy, and he used to carry it with him — it’s tiny. Not only does it have many (but not all) of the words we look up, it also has a nifty verb conjugation feature that he uses to study Spanish verbs. There’s also a calculator and a clock, and he’s found both useful. You type in a word in English or Spanish, and it either gives you the translation or a choice of noun or verb or whatever, and then you choose that to get the translation. Kelly just pointed out to me that it would be useful for one of us to quiz the other on verbs. Clicking on the image will take you to this gadget at Amazon. While I was there, I scanned the reviews of other people for this Seiko Spanish Translator (there are several Seikos listed), I discovered that the people who had written reviews uniformly disliked its vocabulary limitations. So then I got curious and did quite a lot of research, both at Amazon and around the internet. What I found was that these gadgets are ever-changing, that is, I’d find one that somebody loved but that was back in 1998 and so of course it had gone out of stock. I also learned that some of them are sturdier than others. Somebody said that the Franklin brands tended to be the best, but I couldn’t find anyone else commenting on that. So if you are shopping for electronic Spanish translators, or are just curious about them, hitting GO in the search box below will get you to that category. Read the reviews! We have two. My wife has a small Seiko model ET2240 and I use a Franklin BES-1850 (same company btw). The Franklin was close to $100.00. They both are handy. The Franklin is much more comprehensive and actually ‘speaks’ the words. I listen to words and phrases played up to to my ear and then immediately say them to the unsuspecting Spanish speaking person – this works fine. I also find it useful for translating signs and store names etc. I think, at least for a real novice, the more expensive model is really worth the extra dough. It is larger than the Seiko but still easily carried in a pocket or backpack. The thing I didn’t like about it was that it eats batteries like mad. Oh – I got caught up in my modification and didn’t talk enough about the Franklin. In the reviews of the BES-1850 you will see some folks that didn’t like it. It plays low volume (without the super battery). It can be hard to see (works MUCH better with the add on battery in this regard). I use the backlight almost all the time making it very easy to see. The speech is very good I think. As I wrote, I listen to a phrase or word and then repeat it and this works very well – so I must be able to understand with some accuracy. I don’t find it real computerze talk. There are recorded phrases (spoken by a male) and if you ask it to speak a work you highlight a female voice that is a bit more computerized says the word(s). It has a connection for earphones – if you are in a public place reading or on a bus this works well and the audio is still more clear. It also has some conversion programs for decimals, liters, meters for length, temperature, weights, liquids and a separate currency exchange area that is quickly accessed. You can put in the current exchange rate and then it does the rest. I found this VERY helpful at the Pemex stations to keep those people honest and to figure what gas was costing (really good prices there btw in the diesel arena). It has a bunch of common phrases, a rolodex, calculator, time and date etc. Really a handy device. In spite of the complaints in some of the reviews my is highly recommended – but I must again say this is in part working better with the phone battery.